How to verify AKAMAI configuration on Staging? Recently, I got stucked in adding complex access rules to documents hosted on one of website required to be integrated with Akamai. Changing any anything on configuration generates a new version altogether which should be tested prior pushing to Production. Moreover, it takes 50-60 min for Akamai to get it reflected globally. Instead, Akamai allows you to test your configuration prior pushing it to production environment. This is very useful to debug issues and check configuration that you have set in this version of your configuration and takes around 10 min to get the changes being reflected on AKAMAI Staging environment. You just have to DIG edgesuite/edgekey staging environment to know the related Akamai IP@ following by making hosts entry on your local machine. 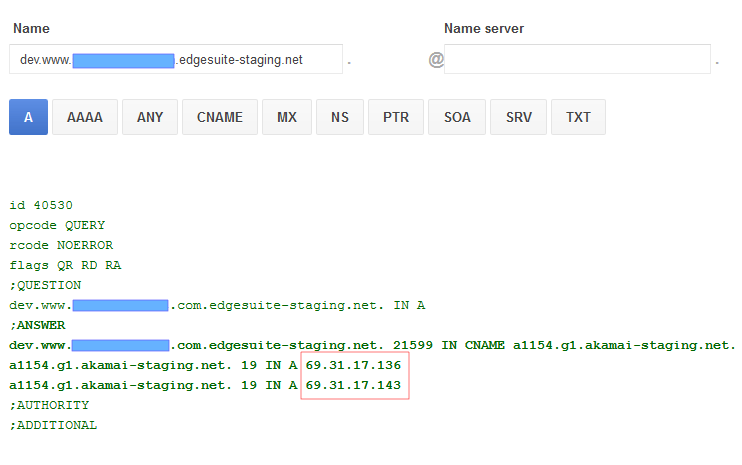 Thanks to Akamai as they sets up “edgesuite-staging.net” or “edgekey-staging.net” CNAME to any of our Production Urls so we can test our configuration on staging environment. This is the default for any CNAME to edgesuite.net or edgekey.net. You can either use Command/Terminal to dig for edgesuite/edgekey IP@ or the Google’s Tool https://toolbox.googleapps.com/apps/dig/ for this. So, now we have IP@ of Akamai Staging servers, you can use this IP@ to make hosts entry on local machine and validate your Akamai configurations on browser. However, if you do not see this configuration then you may need to flush your DNS cache.